» This illustration is applicable to a standard (from medical, life style and occupation point of view) life. » The non-guaranteed benefits (1) and (2) in above illustration are calculated so that they are consistent with the Projected Investment Rate of Return assumption of 4% p.a. (Scenario 1) and 8% p.a. (Scenario 2) respectively. 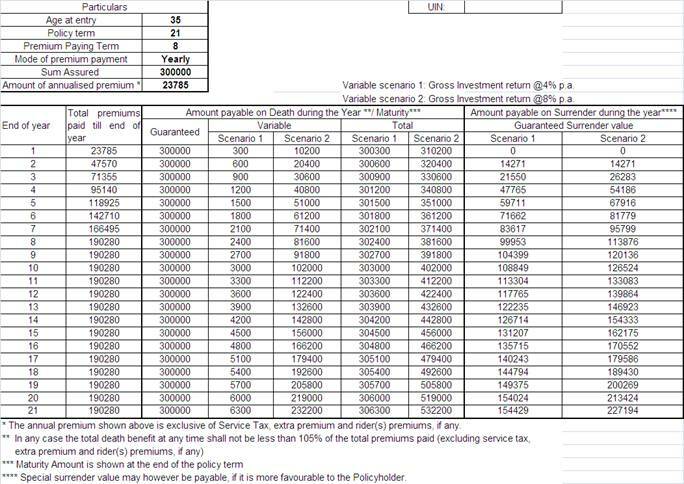 In other words, in preparing this benefit illustration, it is assumed that the Projected Investment Rate of Return that LICI will be able to earn throughout the term of the policy will be 4% p.a. or 8% p.a., as the case may be. The Projected Investment Rate of Return is not guaranteed. » The main objective of the illustration is that the client is able to appreciate the features of the product and the flow of benefits in different circumstances with some level of quantification. Premiums can be paid regularly during the premium paying term at yearly, half-yearly, quarterly or monthly mode (through ECS only) or through salary deductions over the term of policy. 5,00,000 to 9,90,000 – 0.50%o B.S.A. 10,00,000 to and above – 0.75%o B.S.A. If, after atleast two full years’ premium have been paid and any subsequent premiums be not duly paid, this policy shall not be wholly void, but shall subsist as a paid-up policy. The Sum Assured on Death under a paid-up policy shall be reduced to such a sum, called ‘Death Paid-up Sum Assured’ and shall bear the same ratio to the Sum Assured on Death as the number of premiums paid bears to the total number of premiums payable i.e. Death Paid-up Sum Assured = Sum Assured on Death * (no. of premiums paid / no. of premiums payable during the premium paying term). Death Paid-up Sum Assured along with along with vested simple reversionary bonuses, if any, is payable on death of the Life Assured during the policy term. The Sum Assured on Maturity under a paid-up policy shall be reduced to such a sum called ‘Maturity Paid-up Sum Assured’ and shall bear the same ratio to the Sum Assured on Maturityas the number of premiums paid bears to the total number of premiums payable i.e. Maturity Paid-up Sum Assured = Sum Assured on Maturity * (no. of premiums paid / no. of premiums payable). Maturity Paid-up Sum Assured along with along with vested simple reversionary bonuses, if any, is payable on expiry of the policy term. A paid-up policy will not accrue any further bonuses. If the Policyholder is not satisfied with the “Terms and Conditions” of the policy, the policy may be returned to the Corporation within 15 days from the date of receipt of the policy bond stating the reasons of objections. On receipt of the same the Corporation shall cancel the policy and return the amount of premium deposited after deducting the proportionate risk premium (for basic plan and rider(s), if any) for the period on cover, expenses incurred on medical examination, special reports, if any and stamp duty. » If the Life Assured (whether sane or insane) commits suicide at any time within 12 months from the date of commencement of risk and the Corporation will not entertain any claim under this policy except to the extent of 80% of the premiums paid excluding any taxes, extra premium and rider premiums other than term assurance rider, if any, provided the policy is inforce. » If the Life Assured (whether sane or insane) commits suicide within 12 months from date of revival, an amount which is higher of 80% of the premiums paid till the date of death (excluding any taxes, extra premium and rider premiums other than term assurance rider, if any,) or the surrender value, shall be payable. The Corporation will not entertain any other claim under this policy.